That plants and flowers set a gardener’s heart aflutter is a given. Each plant a gardener encounters is often his new “favorite.” But life as a gardener would be less interesting without birds as well. These “flying flowers” bring color and movement to our garden. They also assist with keeping garden bugs at bay, and they can be endlessly entertaining. As a happy coincidence, birds are interested in plants, and gardeners can be effective partners with their local birds by addressing a few simple needs. Birds must have water for both drinking and bathing. About 70 percent of a bird’s non-fat tissue is water, and it must be replenished year round. It is very easy to create a birdbath that is more useful to birds than the birdbaths you see in stores, but even a pedestal birdbath is better than none. Birds would prefer a bath with the following specifications. • At ground level, provided that local cats don’t lurk there. • Shallow, one-half to one inch at the edge, deepening to two inches total. Think of a zero edge pool for birds. • Filled with fresh water that is changed every few days. • Includes a sand or gravel base. • Contains some branches or stones in the water that the birds can hop onto. • If possible, provides some moving water from a commercial dripper or mister, or a bucket with a hole, as birds like water movement and sound. Sleeping, staying warm and dry, and having a secure nesting spot are all essential for a bird’s success. Each of these is relatively easy to provide. Plant a variety of trees, shrubs, and herbaceous plants. That way, birds have access to winter protection in evergreens, shade in summer, and thickets in shrubs that provide nesting for ground-dwellers. Roost boxes, which are available commercially, and birdhouses are also helpful. Our different seasons in the Triangle offer a variety of challenges to birds. Consider delaying your pruning until early spring to give birds more available cover and seeds during the winter. Position houses and shelters facing south for solar gain, and paint them dark colors to absorb the most heat. Provide some insulating materials such as wood chips or dry grasses for birds to use to customize and insulate their homes. Birds are interested in fruits and seeds year round. But their needs for plant food increase during the winter month. 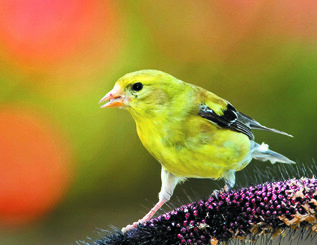 Try these plants to give your backyard birds four seasons of food and nutrition. Summer – Serviceberry (Amelanchier) is eaten by as many as 40 species of birds. Fall – Flowering dogwood (Cornus florida) is eaten by many birds, including thrushes, cardinals, towhees, grosbeak, bluebirds, juncos, robins, and woodpeckers. Fall and Winter – White oak (Quercus alba) is favored by woodpeckers and wood ducks. Eastern red cedar (Juniperus virginiana) is eaten by many birds, including waxwings, bobwhite quail, ruffed grouse, sharp-tailed grouse, ring-necked pheasant, and wild turkeys. It also provides nesting and cover. Northern bayberry (Myrica pensylvanica) is a primary source of winter food for many birds, including bluebirds. It provides nesting and cover. Nannyberry and arrowwood (Viburnum) are eaten by robins, bluebirds, thrushes, catbirds, cardinals, finches, waxwings, and other birds. Beautyberry (Callicarpa Americana) is eaten by mockingbirds and as many as 10 other species of birds and squirrels. It also provides nesting and cover. Your garden has never been more important to birds. It is estimated that nearly 80 percent of the United States habitat used by wildlife is privately owned land, and an average of 2.1 million acres each year are transformed into home sites. Your back yard can be beautiful and enjoyable for your family and for the local birds. Jan Little is the director of education and public programs for Duke Gardens. For information about classes and events, visit the Duke Gardens.